We’re so ready to deck the halls here at Get Community! And, to kick off the holiday season, we sat down to a homemade Thanksgiving feast right here in the office. After taking our picks for entrees and side dishes, and toiling away in our kitchens, it was time to sit down for a nice work-family lunch. Part of Friday lunch responsibility is that meals be made with love rather than store bought. It may seem like a lot of work for a busy group of people, but you know what? Lunchtime becomes a meaningful event where you can talk about your inspiration (or sheer frustration that the sauce for your mac n’ cheese was a fail and now the whole dish is bland) and you can appreciate that what you’re eating was planned out and prepared with your enjoyment in mind. We call it team bonding. We’ve even added a channel in Slack (our fave workplace app) for sharing all the scrumptious recipes we enjoyed! 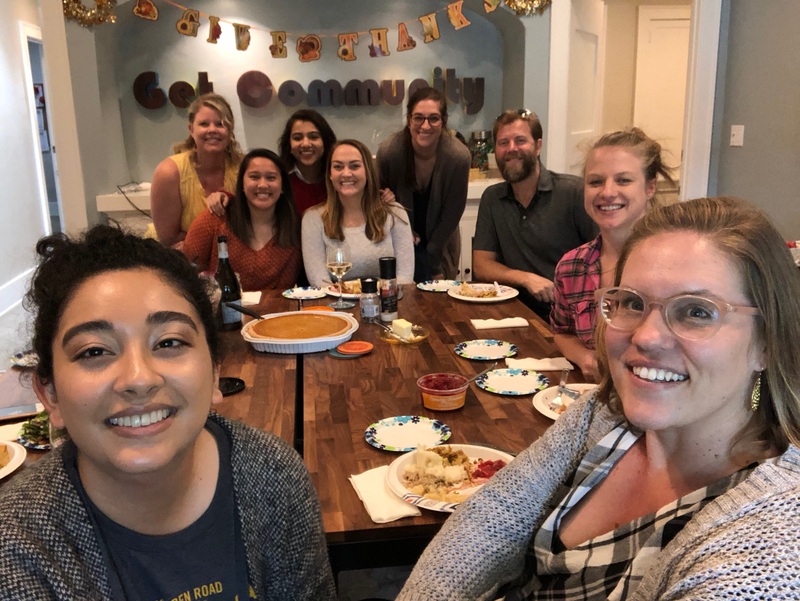 Our Thanksgiving bonding session was an extra special occasion with all of us bringing in our culinary contributions and sharing what we are most thankful for. A little sappy maybe, but at the end of the day we leave knowing there’s a real bond between us. Don’t you think the smiles say it all?